The sound of aircraft flying overhead at all times of the day and night was a daily wartime experience. However, just before before 3 am on the 30th of January 1943 the residents at Captains Barn Farm on Leek Road were woken by the sound of loud aircraft engines followed by a horrible thud coming from a nearby field. R 1538 had been assigned to No 28 Operational Training Unit, 93 Group, B Command. The crew were undertaking a long duration night navigation exercise and had taken off at 7.30 pm. This was one of the final stages of the training programme and the crew would have been looking forward to their transfer to an operational bomber squadron. The exact route flown by the aircraft is not known but it certainly encountered very poor weather as it flew over North Staffordshire. Flight in cloud requires the pilot to concentrate on the instrument panel. Without the ability to see the ground the crew were totally dependant on the instruments to indicate the direction and height of the aircraft. It appears that in this case the pilot did not realise that he was flying dangerously low and the aircraft struck the rising ground 1.5 miles north east of the crossroads at Weston Coyney. One of the survivors expressed the view that the aircraft altimeter was either faulty or that it had been accidentally set to the wrong datum at some stage during the flight. 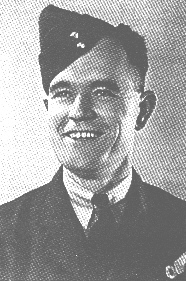 Observer : Flt Sgt T. Butterley R.A.F.V.R. W/Operator : Flt Sgt R.R. Clarke R.A.F.V.R. A/Gunner : Flt Sgt A. Priest R.A.F.V.R. Flight Sergeant Priest and Flight Sergeant Butterley were killed in the accident, the other members of the crew were injured but survived.